Have a tent or canopy. At first it didn't seem to be in issue, but at noon, all my tea lights were doomed. Ok, I feel Mr. Obvious knocking at my door on that one, and I'll address the heat in a moment. But also, a tent creates a sense of space for your "shop", encouraging shoppers to come inside. Since I'm not certain I want to do a lot of shows, I'm reluctant to purchase a tent. Fortunately, I'm able to borrow one from a family friend. Protect your wares. Did I mention my tea lights were doomed? I decided to put only one item on the display table and most of my inventory underneath. I'll pull from the inventory and give the purchaser a cooler candle. Give people a reason to visit you. I offered a fragrance basket as a giveaway. This encouraged quite a few to stop and sniff. While I had their attention, I asked what their favorite fragrance was and directed them to a sample. Use the show as part of your marketing strategy. As I mentioned, I offered a fragrance basket as a giveaway. In doing so, I collected names and email addresses to add to my newsletter list (of course, my follow up email was "Thank you for visiting me" and contained a subscription link). When asking people about their favorite fragrance, I was also able to gain ideas of what people like to buy. Be prepared to improvise. I thought I forgot my order forms and sign up slips. My receipt book became my order form - just wrote order on the slip to notify myself - and my planner notes paper became my sign up slips. Now of course, I also had small bills and change, variety of price points, and my Square Up credit card reader. I gave out newsletters and stapled my business card to the receipt. Bags and thank you gifts. This weekend I'll also have a few shelving units and baskets to create varying heights, as well as a second table for an L-shape. I don't have resources to invest in a sign. How do I show who I am without one or with minimal budget and time to create one? I'm selling primarily candles in June. How do I create the sense of a "full shop" if I keep most of my inventory under the table in order to keep it protected? I've planned most of my inventory to include five cases of 10 fragrances. How do I know if this is the right fragrance diversification? I'll also have all of my inventory of other fragrances, so my total should be about eight cases. How do I know if this is enough? I'm excited about this opportunity, but extremely nervous as well. I'd appreciate your feedback and recommendations! It's been fun! I've truly enjoyed the creativity D'Lites has brought to my life. It's not just in the candlemaking or the choice of fragrance and color. It's been in doing cost analysis for pricing, it's been in developing marketing strategies, and it's been in learning how to manage my time with this new avenue in my life. It's been hard work. I have to be honest here - I really thought that because I enjoy candles so much that my candles would be so popular people would flock to my product! Yes, I acknowledge the level of naivete I felt a year ago. Wow. Social media has caught me by surprise. I really didn't do much social media work until I joined the Promotional Frenzy team on Etsy, where social media participation is a requirement. I've learned so much about social media and how it has changed the face of marketing as we know it. I've surprised myself with how my product has evolved. 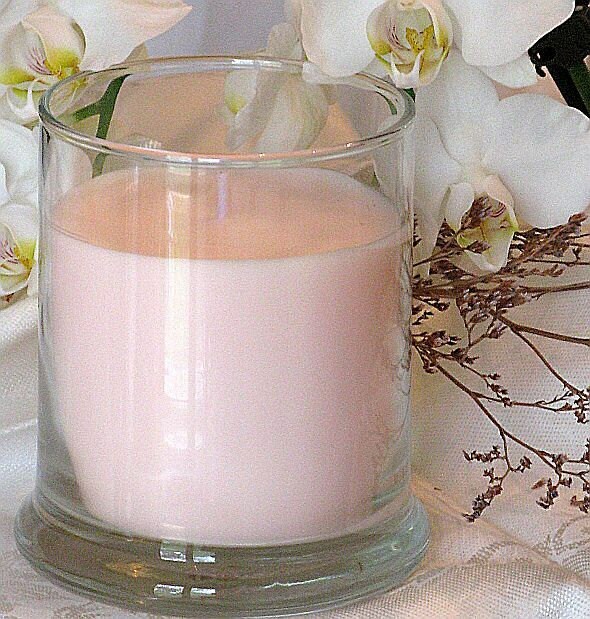 Starting out with container candles, I've since evolved into other candle products such as tea lights, fragrance tarts, and votives. I've evolved into other home fragrance products such as fragrance sprays and diffuser oils. I've evolved into bath and body products such as washes, lotions, and sprays. These have been surprisingly natural outgrowths for vertical integration of my work. *sigh* I'm still photography challenged. My photos have significantly improved, and I've accepted the fact that I need to ask for help in this area. I can handle rejection better. I'm learning not to take "no thank you" quite as personally as I did a year ago. I could go on and on. But suffice it to say I'm excited about where I've been and where I'm going. As a special thank you for my one year anniversary celebration, I am offering you, my loyal readers, a Buy One, Get One 50% off special. Please mention this blog posting when you call or email me or use coupon code 1YEAR when shopping my Etsy site. In addition, all customers throughout the months of May and June will be entered into a drawing for an additional Buy One, Get One 50% off coupon. *50% off item must be of equal or lesser value. Offer includes sales and clearance items. Only one gift basket may be included with this offer. One of my favorite memories growing up was visiting my grandmother Mimi on Mother's Day. Hopefully the weather was agreeable, and we would enjoy the day among the flowers at Mt. Airy Park in Cincinnati. My grandmother enjoyed flowers, and one of the houseplants she grew best were orchids. Such lovely, delicate flowers. When I came across the fragrance Orchid Rain, I knew I had found my fragrance of the month for May. Orchid Rain is a beautiful combination of floral and fresh outdoors. Modern and spa-like, top notes include fresh orchids, peony, water lily, with middle and final notes of watercress, aloe vera, and bamboo. Open your mind and soul to complete harmony! If I had had this post ready by Mother's Day, I would have told you Orchid Rain is a perfect fragrance for a gift for Mom! At this time, I'm especially glad to have ventured into body fragrances, as I think Orchid Rain is an especially beautiful scent for body lotions and hand balms. Lightly floral, it's a perfect fragrance to wear by itself or under your floral perfumes. Throughout the month of May, Orchid Rain is 10% off. Stop by to try some today!